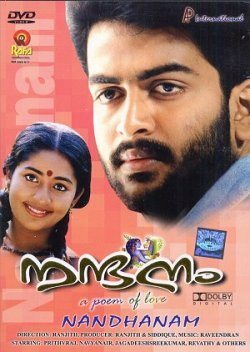 Nandhanam is based on the King Cophetua and Penelophon story and while it’s a fairly typical tale of a rich(ish) young man falling in love with the family maid and the various dramas that ensue, there are enough novel moments to make it more involving than it first sounds. The story is simply told, the characterisations are beautifully drawn and the actors all play their parts with ease. This was Prithviraj’s debut Malayalam film and he’s ably supported by some stalwarts of the industry along with a brilliant Navya Nair as Balamani. In fact it’s her performance that really lifts this film above average and it’s worth a watch just to see her character deal with the various obstacles in her path to true love. Balamani is a young orphan working as a cook and general helper to Unniamma (Kaviyoor Ponnamma) who has been incapacitated with a leg injury. Balamani is a devoted follower of Lord Krishna and her biggest problem is that since she started working for Unniamma she has been too busy to go to the local temple. It’s a recurring theme which becomes more and more important as the story progresses. She is kept hopping from the early hours of the morning by three older women who were brought to the house by Unniamma’s friend Kesavan Nair (Innocent) to act as servants but all three prefer to be waited on hand and foot by Balamani. The interactions between the three servants and Balamani are funny and cleverly scripted as Balamani looks after them and somehow fulfils all their ceaseless demands, but simultaneously pulls faces behind their backs and berates them as lazy to their faces. Balamani seems to have endless patience despite her grumbles and she is genuinely kind-hearted and caring in her dealings with Unniamma, and even with the other three servants. They bicker and complain continuously to each other about each other, although they never seem to either take any offence or mean any of it seriously. I love these three and they have some of the best lines in the film – although that might just be the English translations! 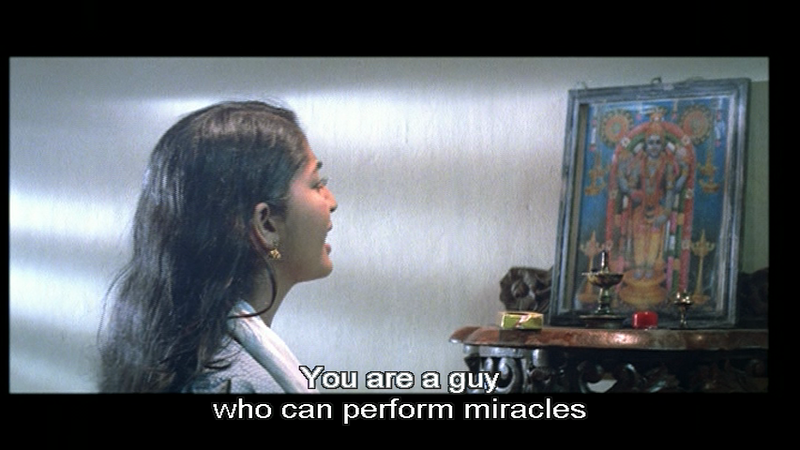 One of the best parts of the film for me is the way Balamani talks to herself and also to the picture of Lord Krishna she keeps in her room. In fact she talks to the animals she looks after, the plants she waters in the garden and anything else that seems to catch her eye. I can totally relate to this aspect of her personality and it made her a more human and sympathetic character. Her main confident in these discussions is Lord Krishna and she complains to him about not being able to go to his temple and about the amount of work she has to do, although none of it is with any rancour. 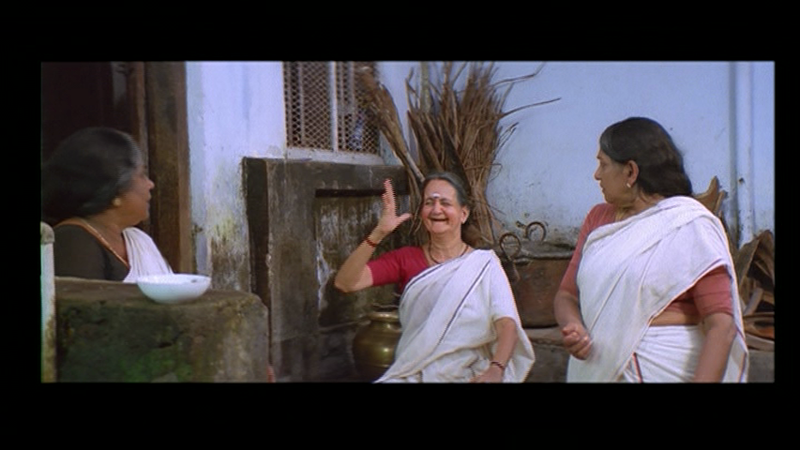 Added in to the story are the next door neighbour Janaki (Kalaranjini) who is a friend of Unniamma’s daughter and is waiting for her son to come home on a visit. Janaki is another confidante and she tries to minimise her exploitation by the three older servants. Things change when Unniamma’s grandson Mano (Prithviraj) arrives for a short stay before he leaves for work in the USA. He starts to flirt with the vivacious Balamani but before long it turns into something more serious and the two fall in love. 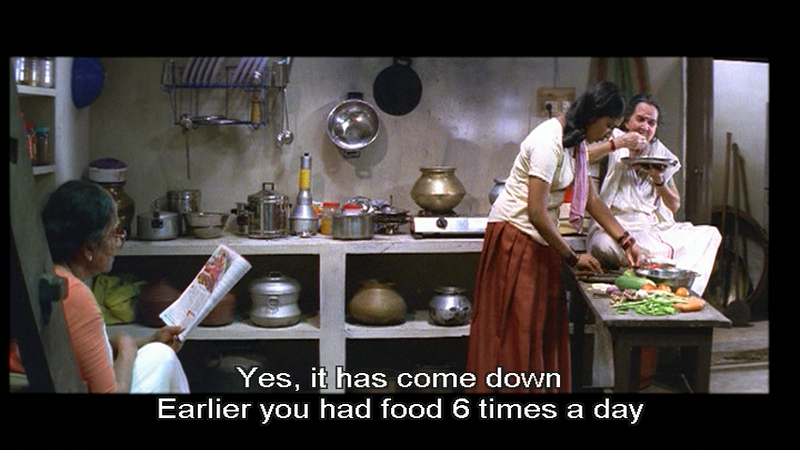 But it’s not a straight forward filmi romance and the dialogue helps keep it realistic. Balamani asks Mano if he is really serious or if this is just a brief fling to keep him amused before he leaves the country. Mano in turn seems to be quite sincere when he answers that it started out that way, but has become something more serious. Balamani is also aware of her lowly status in comparison to Mano and is wary of the relationship, although she is obviously flattered and very much in love with Mano. Prithviraj seems subdued as Mano, compared to other roles I have seen, but it suits his character and he combines an air of experience with just enough of the mama’s boy to make Mano a believable character. Mano does seem to be a bit of a wimp and most of the problems Balamani faces are due to his lack of gumption and resolve. 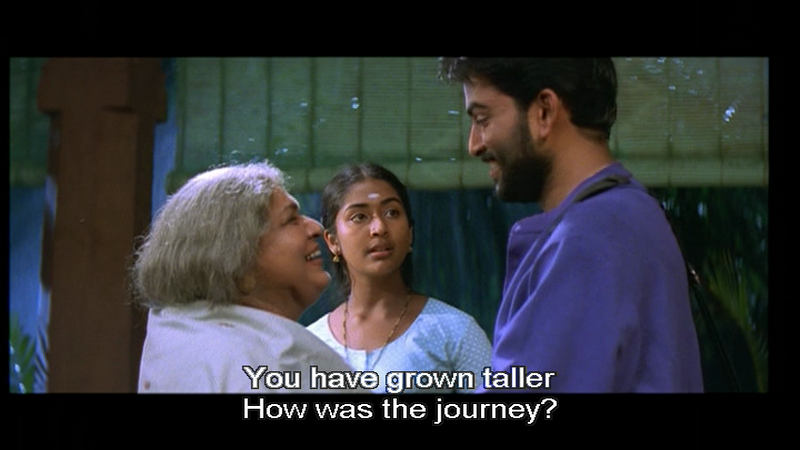 Just when things seem to be going so well, Mano’s mother (Revathy) turns up and decides to arrange his marriage before he leaves for America. Pesky details such as visas are never discussed and it seems to be no trouble to organise a wedding in just a few weeks, so obviously here is where we start to depart from real life! Thankam doesn’t discuss her plans with Mano, while Mano is slow to approach his mother about his plans to marry Balamani, with the end result that he is betrothed to the daughter of one of Thankam’s friends before he can make his wishes known. Thankam is a widow who defied her family to go to work and bring up her son alone, so she’s definitely not a soft touch and has no hesitation in telling Mano that the match will go ahead no matter what he wants. However Thankam is also distressed to have caused her son such unhappiness, particularly since she likes Balamani, but it’s not enough for her to upset the arrangement she has made. The family dynamics are further explored when all the relatives arrive for the engagement and wedding with many complaints about the precipitous nature of the affair. Writer/director Renjith emphasizes the solitary state of the groom compared to all the family hustle and bustle with the wedding preparations and the frantic work being carried out by the servants, including Balamani. Meanwhile Janaki’s son has arrived – or has he? Balamani meets the person she thinks is Unnikrishnan (Aravind Akash) and is soon on very friendly terms; even confiding her innermost thoughts to him while he appears to already know her hopes and dreams. I was a bit sceptical of Aravind as Guruvayurappan at first but he did seem to embody the mischievousness nature of Krishna with a singular lack of concern about the consequences of his actions. Plus he can dance! The addition of the divine into the narrative is cleverly done and never seems out of place, despite the generally modern feel of the rest of the story. 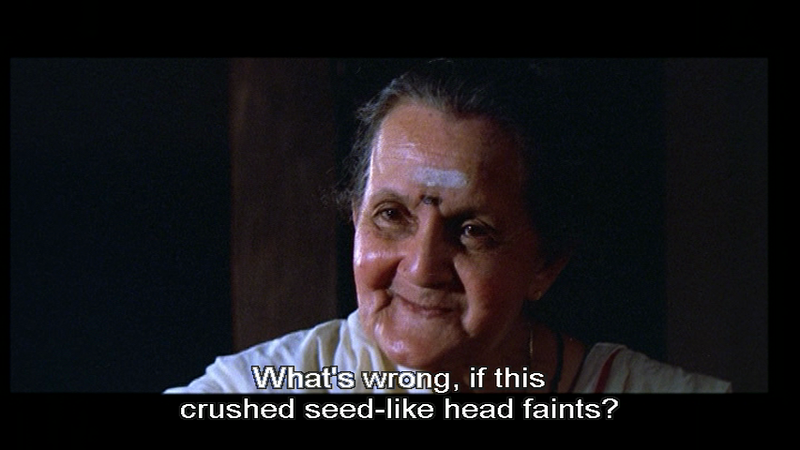 However there is a terrible comedy side plot which is somewhat related to the main story involving Jagathis Sreekumar as a duplicitous priest. It’s never funny and most of Jagathis antics could have been left out without causing any disruption of the plot, so his inclusion does seem to be more a ‘film-making by the numbers’ rather than for any real addition to the storyline. The music by Raveendran is beautiful, and of course it’s a Malayalam film so it looks stunning with wonderful cinematography by Azhagappan. Worth watching for a new take on an old story, fantastic performances, great dialogue and a scintillating performance from Navya Nair. 4 stars. This entry was posted in Mollywood and tagged Aravind Akash, Azhagappan, Innocent, Jagathis Sreekumar, Kalaranjini, Kaviyoor Ponnamma, Malayalam, Nandanam, Nandhanam, Navya Nair, Prithviraj, Raveendran, Renjith. Bookmark the permalink. 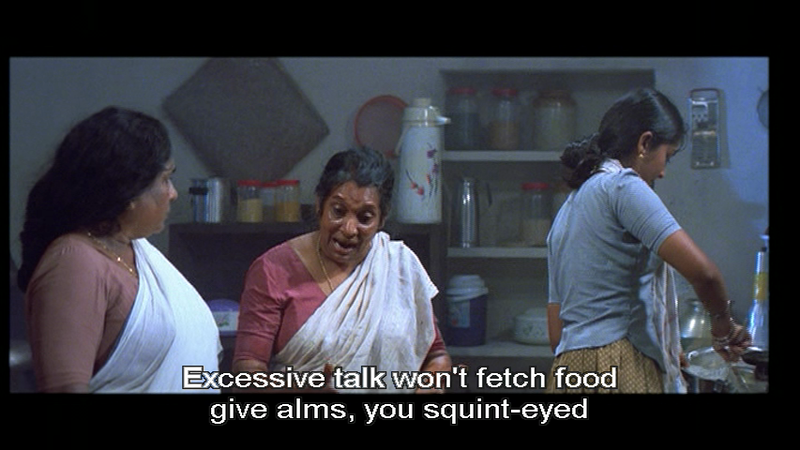 I get quite a few more obscure Malayalam films from them.